Photograph of tombs of the Lodi Kings near Delhi from the Archaeological Survey of India Collections, taken in the 1880s and attributed to Henry Hardy Cole (the attribution is probably incorrect). The Lodi sultans were an Afghan dynasty who ruled over Delhi between 1451 and 1526 after the fall of the Sayyids. Tombs are the most significant monuments of both the Lodi and Sayyid periods and many were built in a necropolis now known as the Lodi Gardens, including that of Sikander Lodi (r.1489-1517). The tombs are either square or octagonal with large central domes, and are often called “gumbad” or “gumbaz” from the Indo-Persian word for dome. This is a general view looking towards buildings in the gardens. 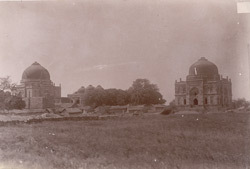 On the left, obscured by trees, is the Bara Gumbad, a mausoleum dating from 1494 which was later converted to become the entrance to the mosque in the walled garden surrounding Sikander Lodi’s tomb. On the right is the late 15th-century Sheesh or Glass Gumbad, so called for its dome which was originally covered in glazed blue tiles.